Time: Dinner 6 to 7:30 p.m.
Place: Latvian Hall, 504 Grand N.E. 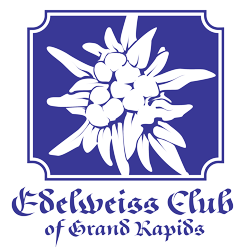 The Edelweiss Choir is proud to present a concert of German folk songs and classical songs. The concert is free and open to the public. Dinner is $5.00 for full members and $10 for all others. Must be paid in advance by mailing a check to P. O. Box 1681, Grand Rapids, 49501 or use the Paypall option below to pay with your credit card. Open the drop down box by clicking on the ‘=’ and choose the dinner ticket you need, click on ADD to CART and follow the on-screen instructions. To purchase multiple tickets, increase the counter in the “shopping card window” or click on “Return to Shopping”. When you are satisfied with the content of your “Cart”, click on “Pay with debit or credit card”. A small service fee is included in the membership price.